The deets: J.Crew pencil skirt; Loft sweater tee; Banana Republic boots; scarf and ring c/o D'Milikah; hat c/o Seams to Be; Ray-Ban sunnies; Lancome "Violette Croquette" lipstick; Gigee Marie clutch (win from LIBB). One of my favorite parts of cooler weather is being able to give my locks a break thanks to the sweet camouflage skills of my cozy hats. They are the best for keeping you warm, and letting your second day hair do its thing with out anyone knowing about it. I am seriously obsessed with this one by Seams to Be, I had the same one last year in a lighter color but I guess my pup was also pretty obsessed with it and decided to eat it. Lucky for me she had a similar color in stock this season! Go check her out. You look adorable! I've tried to pull off this look in the winter before and it looks just silly on me. You look so cute! I wish I could pull of hats, but I've tried, and they just don't work with my head. how cute!! 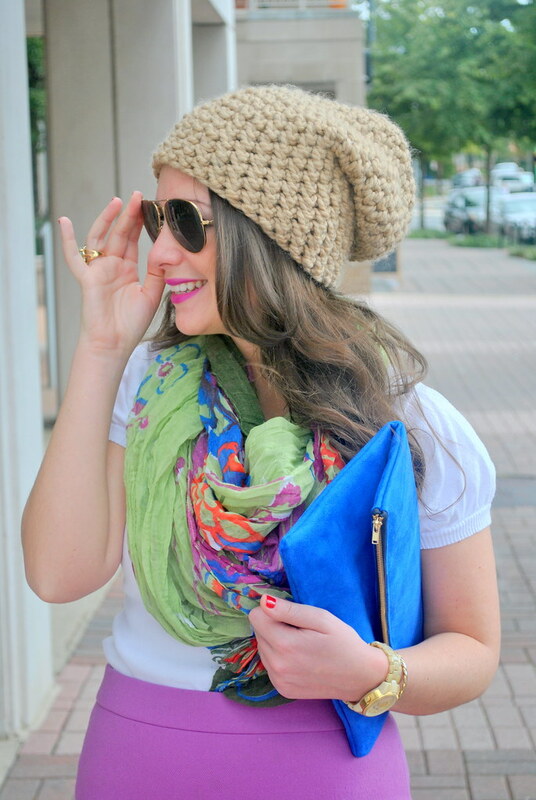 i love the colors on the scarf! I love your hat, I'm a really big fan of winter hats. You look so amazing! 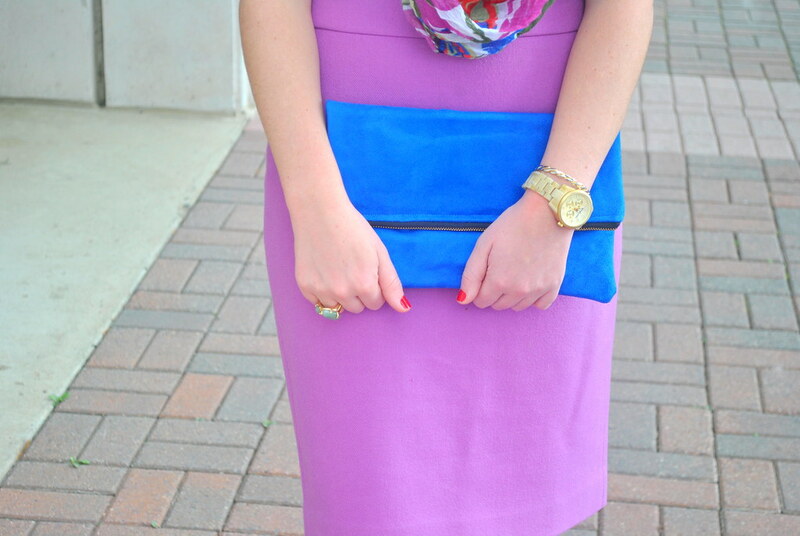 I LOVE this entire outfit, the bright colors are actually really refreshing! Love the skirt and the scarf and that hat is just adorable on you! 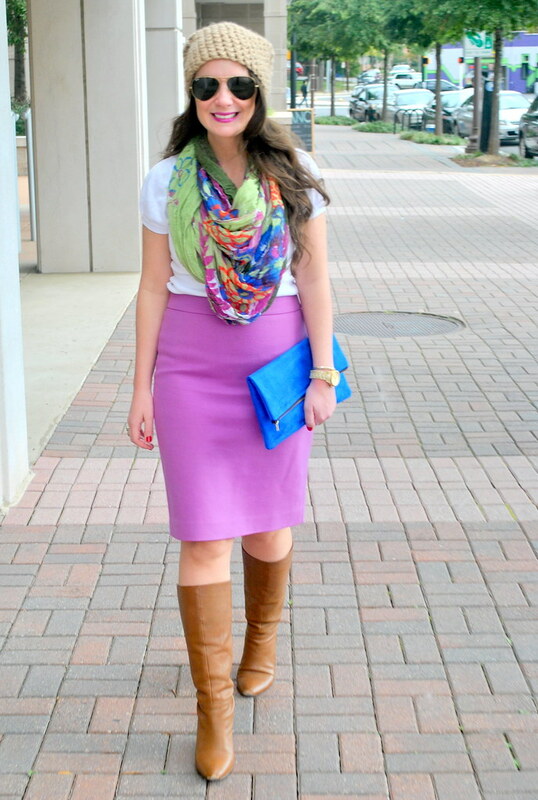 I am loving the bright scarf, skirt and GM clutch! Great colors and a more "fall" look that's not blah. Gorgeous, girl! Um. I am in love with that hat as well! I want one! Adorable look! I got one of those clutches too and I love it! Lovely outfit, the hat is so cool! you look adorable! love the color of your skirt, so lovely! This look is so bright and fun...I love it! Also, I'm seriously crushing on that hat. I'm going to have to pick one up! I absolutely love this look! I have similar color skirt and boots as you and now I'm dying to try them together! Love the cozy hat too, but unfortunately, it's not cold enough here for hats yet. I'm totally loving this outfit! That skirt and the scarf, seriously such a great combo! The bright colors are so refreshing too! The colors of that scarf are just so pretty! I think we have the same J.Crew skirt. I couldn't resist the color. you mix the most fabulous colors in your outfits! I love beanie season, and this one is gorgeous! 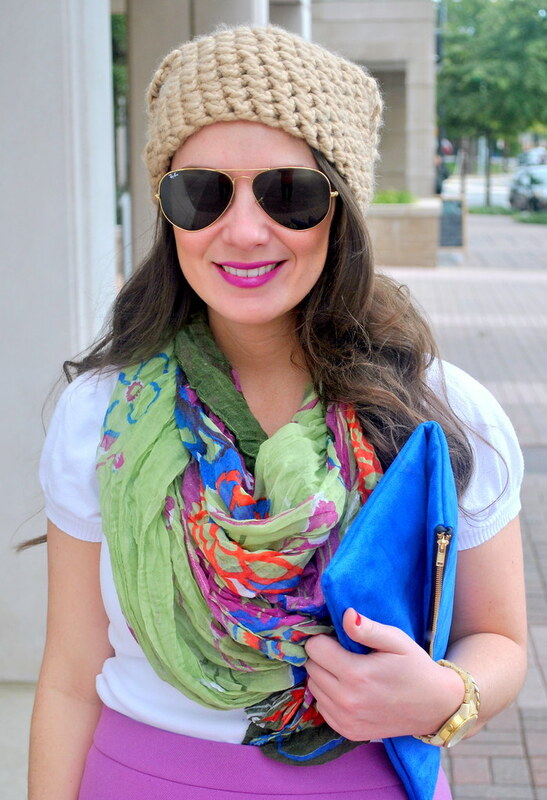 Fun scarf, love all the pretty pops of color. Love the fall vibe, yet colorful demeanor of this! so cute! 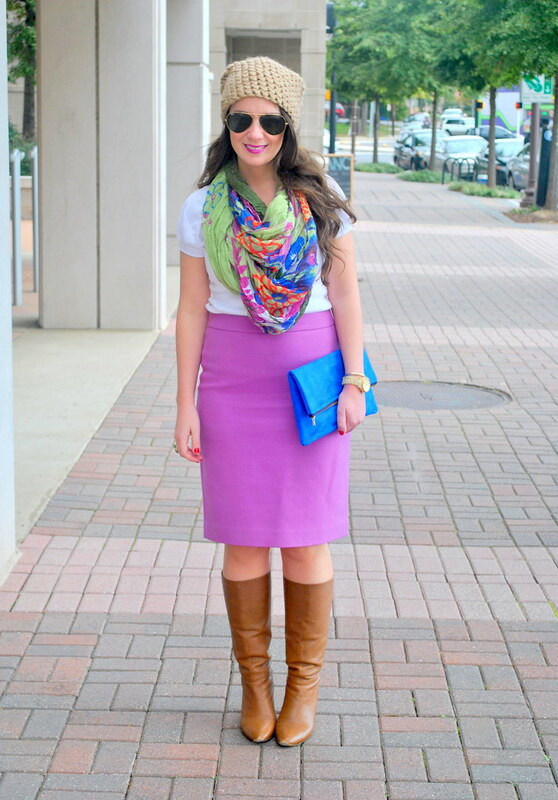 Sooo many bright colors in one outfit, I love the twist for fall. Of course, I'm right there with you on the cozy hat trend!